This is part 3a of the translation of my treatise Jesuspassagerna hos Josefus – en fallstudie into English. The paragraph deals accordingly not primarily with the death of James, but with Ananus being removed from the high priesthood, because he exceeded his authorities by killing James and some others, and that Jesus, the son of Damneus, was appointed new high priest. The fact that Jesus in the James passage is identified as the one “who was called Christ” is usually cited as evidence of Josephus having written the passage. The argument presented is that if a Christian would have added the part on Jesus, he would have written that Jesus was Christ and not just was called Christ. 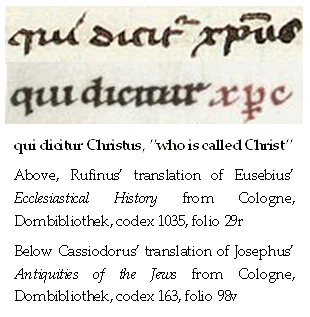 But apart from the fact that Josephus in the phrase “who was called Christ” (tou legomenou Christou or τοῦ λεγομένου Χριστοῦ) uses an oblique (declined) case, it is the same expression as in both John 4:25 and Matthew 1:16: “of whom was born Jesus, who is called Christ.” The phrase is found in a similar form in Matthew two more times, then in 27:17 and 27:22; and the author of the Gospel of Matthew has Pilate both times designating Jesus as that “Jesus who is called Christ”. The manner of letting a non-Christian witness identify Jesus as the one who was “called Christ” can accordingly be traced back to the Gospels. This would reasonably imply that it would not have felt unnatural for a Christian person with knowledge of the Gospel accounts to designate Jesus as the one called Christ, if he later found that Josephus ought to have mentioned Jesus. The so-called Christ. Sometimes the phrase ton adelfon Iêsou tou legomenou Christou is translated as “the brother of Jesus, the so-called Christ”. It is thus not translated into “who was called Christ” but rather into “the so-called Christ”. This result in an even greater dissociation from the understanding that Jesus would be Christ and thus makes it more likely that Josephus could have written this sentence. But there is really no need to translate the text in that way, even if it is possible if the context would require this. The reason this translation is proposed at all, is a peculiarity of the Greek language, where as in this case a definite article ton not only precedes “brother” (adelfon), thus forming “the brother”, but also an additional definite article tou precedes “was called” (legomenou). This could then be understood as if legomenou “was called” also should be expressed in the definite form as “the so-called”. However, this way of constructing sentences, then by repeating a definite article before a determinative adjective when it follows the noun it complements, is quite normal in Greek. This is normal, and it does not mean that the adjective is necessarily meant to be in the definitive form. In this case legomenou (was called) is a determinative adjective (it is actually a participle but is used as an adjective) to the noun Iêsou (Jesus). In the New Testament similar expressions are not typically translated into “the so-called” but “is called” or “was called”. This also applies to all the four times when the term is used in connection to Jesus (Matthew 1:16, 27:17, 27:22 and John 4:25). When the Greek tou legomenou in these passages was translated into Latin in the Versio Vulgata, it was translated into qui dicitur (except in Matthew 1:16, where the synonymous expression qui vocatur was used), which means “is called”. Also Rufinus in his translation of Eusebius’ Ecclesiastical History and Cassiodorus in his translation of Josephus’ Antiquities of the Jews translate this into qui dicitur. “The brother who is [was] called Christ” is normally expressed as ton adelphon tou legomenou Christou in Greek, with no connotation of questioning the legitimacy of the designation of Christ. One thing that tells against the genuineness of the two passages on Jesus, that is the Testimonium and the paragraph that identifies James as “the brother of Jesus called Christ”, is the presence of the word Christ/Messiah in both passages. In the first passage it is said that “he was the Christ” and in the second that he “was called Christ”. As previously pointed out in Josephus’ and other Jews’ view of the Messianic concept, the word Christ (the Greek equivalent of the Hebrew Messiah) never appears in Josephus other than just on the two occasions when Jesus is mentioned. This fact indicates that Josephus rather not liked to discuss the Messianic concept which was so associated with the uprisings among the Jews. This in turn suggests that these passages were later insertion made by a Christian hand. Only once does Josephus actually appoint someone to have been the long-awaited Messiah; albeit indirectly and then the Emperor Vespasian. But not even on this occasion does he use the word Messiah. Since the predicate of the main clause is in the past (delivered to be stoned), tou legomenou is best translated as “was called” and not “is called”. Here the past tense only shows contemporaneousness. Earl Doherty, The Jesus Puzzle, Supplementary Article No. 10, Josephus Unbound: Reopening the Josephus Question. Ἰησοῦ τοῦ λεγομένου Χριστοῦ (Iêsou tou legomenou Christou) = Jesus who was called Christ (Antiquities of the Jews 20:200). Ἰησοῦς ὁ λεγόμενος Χριστός (Iêsous ho legomenos Christos) = Jesus, who is called Christ (Matt 1:16). ὁ λεγόμενος Χριστός (ho legomenos Christos) = [he] who is called Christ (Joh 4:25). Ἰησοῦν τὸν λεγόμενον Χριστόν (Iêsoun ton legomenon Christon) = Jesus who is called Christ (Matt 27:17). Ἰησοῦν τὸν λεγόμενον Χριστόν (Iêsoun ton legomenon Christon) = [with] Jesus who is called Christ (Matt 27:22). Earl Doherty, Jesus: Neither God Nor Man – The Case for a Mythical Jesus (2009), p. 584; note 220, p. 771. ”Brother of Jesus” does not necessarily denote a sibling of Jesus, See Earl Doherty, The Jesus Puzzle, Chapter 6, page 57. ”Brother of Jesus (Cf. Galatians 1:19, Corinthians 15:6 and Philippians 1:14). If one reads Josephus’ passage about James in the light of this, he may very well be referring to just an early Christian. I am aware of Doherty’s argument and was aware of the same arguments even before Doherty first became public. Are you suggesting that Josephus is referring to James, a follower of Jesus? That perhaps might have been the case if it would have been written by a Christian; such as you propose by referring to Paul. But as long as there are no signs of Josephus being a Christian (then of course apart from the Testimonium), I find no reason to suppose that he would have designated a certain James as a Christian by using a word like brother in the meaning of brotherhood; the way Paul probably used the word. I’m late to this discussion, but I investigated the Greek verb for ‘called’, armchair scholar that I am, in the Lidell-Scott-Jones Greek-English Lexicon at Perseus Tufts Digital Library. The verb λεγομένου is returned as a Verb participle, singular, present tense, middle/passive voices, masculine gender, genetive case. It means: ”of calling one’s self” or ”of being called.” The other words in the phrase are also in the genetive case. And the noun Χριστοῦ is returned as a noun, singular, masculine, genetive, meaning not only messiah, but also an anointed one, or that which is anointed, or even a white-washer! Ἰησοῦ and τοῦ are also in the genetive case. One fact is that Jewish high priests and kings were anointed with oil when being inducted into office. Jesus Ben Damneus later in this paragraph becomes a high priest. The James referred to in Ant. 20.9.207 could have been the brother of one who was to become high priest — and knew it and let everybody else know it, too! Oops… forgot to check the Greek on ”delivered to be stoned.” Just did it. The predicate of the main clause is just like you said. So the Greek for ”the brother of Jesus, who was called Christ” has a possible translation of ”the brother of Jesus, who [at the time] was called (by others or by himself) Christ (or a messiah or an annointed one)” to reveal the contemperaneous present participle of the verb. Roger, it is sufficent if James called himself a bretheren. It may have been his title. And yes, this is a somewhat old theory, even according to Catholic creed, James was not a sibling of Jesus. (However, they claim they were cousins). In any case, I see ”The brother of Jesus” more as a title than an expression of family bonds. The early Christian sect may very well have called themselves ”brothers of the savior”. If I recall, there is a similar title used in the Dead Sea Scrolls, isn’t it? Disregard my comment about the Dead Sea Scrolls. It’s based on assumptions by Eisenmann and controversial. Thanks Ed-M and Fredrik for your thoughts. I do think Josephus very well could have been referring to James, the son of Damneus also when he identified the executed James, so that both James and Jesus were brothers, sons of Damneus, and members of one clan of priests. I doubt that Josephus could have written “who was called Christ”. You’re welcome Roger! If Josephus did write that passage, it would have been immediately been preceded ”son of Damneus” and people would interpret the famous passage as ”who called himself an anointed one.” Assuming the Roman audience reading the passage understood that Χριστοῦ meant anything other than ointment. And assuming that word was not capitalized when it first showed up in that passage in the first place. The only way Josephus could have wrote that passage with Χριστοῦ capitalized would be that there WAS somebody named Jesus gallivanting about Judea calling himself the Messiah and came to a bad end under the prefect Pilate or a later procurator. And what Josephus would have said about this man was nothing good! And then, why would it be capitalized, when names normally were not capitalized in those days? I did not know the names were not normally capitalised in those days. I learn something new every day. Makes me more convinced than ever that ”who was called christ” was a Christian forgery to back up their blatant christian propaganda in 18.3.3. It’s non very interesting, because it’s full of contempt and attack ad personam. First error: before he says that Origen reads the original (Josephian) ”brother of Jesus called Christ” and invents the causal link ”death of James–> siege of Jerusalem”, but then says that the same legend was born in Hegesippus, but *not* also argues that Hegesippus drew from Josephus. Second error: it is when he says that it is impossiblethat Ananus filled of presents just the his victim’s brother: he forgets to say that those gifts served to threaten implicitly both Jesus son of Damneus and Albinus, because they were obtained by robbing the people ((and therefore meaning that Ananus was still strong and able to dictate the rules).